If you have a child exhibiting symptoms of defiance, anger, rage, and more, these tips for a holistic oppositional defiant disorder treatment are for you. The anger. The yelling. The tears. The mood swings. And I’m just talking about the behavior of the mama of a child with Oppositional Defiant Disorder. I kid, but let’s be honest, having a child with ODD is hard on the whole family. If you’ve read my post on how we healed symptoms of PANDAS, it will come as no surprise that we’ve taken a holistic approach to our oppositional defiant disorder treatment. The symptoms of ODD and PANDAS actually overlap a lot, and though they have two different clinical names, the white coats tend to be behind on the fact that emotional and psychiatric disorders are caused by underlying infections. For our son, it was all wrapped up in a strep infection in his gut. I had made the obvious connections with diet and pinpointed reactions to food (read about one surprising trigger food here), but it was years after the onset of his ODD symptoms that we had testing done which revealed the strep infection. That was when the real work started. If you’re living with a child with symptoms of oppositional defiant disorder, you’re probably at your wit’s end, wondering what you can do to help your child. may also suffer from depression and anxiety. Indeed, our son had all these symptoms and more. Thankfully, at the onset of his symptoms, our family was already interested in healthful eating and natural remedies, so a holistic oppositional defiant disorder treatment wasn’t a stretch. Earlier this year, we rid our son of ODD for the first time since the whole ordeal started (he developed symptoms following an illness when he was four, which is associated with PANDAS). If you’ve heard me say it once, you’ve heard me say it a thousand times: diet is king. Before anything else, you have to get your child’s inflammation and food reactions under control. In a disorder like ODD, a couple of things are happening behind the scenes. For one, the child is reacting to triggers in his environment: food and other toxins like mold and chemical exposures like laundry and cleaning supplies or home fragrances. Secondly, poor food choices feed unwanted pathogens, making them stronger while the immune system and gut become weaker. Children with ODD and related disorders (think of children on the autism spectrum, which is inclusive of a huge range of behaviors) are very sensitive. If they have a steady stream of toxins entering their body, their body will stay bogged down and their neurological and emotional health will be compromised. Not only should you switch to natural products in your home, but it is very necessary to change the diet of a child with ODD. We started with removing these five ingredients. Following the removal of harmful food additives, we removed refined sugars (see my guide to sugars to learn about acceptable replacements), then gluten and all grains, as well as processed dairy (we eat high-quality dairy which is raw, cultured, and grass-fed), and, eventually, we did the GAPS diet. Changing our son’s diet got us 75% of the way to healing. The only problem was that he could not tolerate any cheating. Even a small amount of residue resulted in a meltdown. After we found out about the strep, we tried lots of options for a natural oppositional defiant disorder treatment. Some were helpful, but most waned after time. At the beginning of last year, we saw a holistic PA, who did the testing for us that revealed the strep infection. He also put us on a supplement called Liver Life from BioRay. I noticed an immediate improvement in both my and my son’s health after taking this liver support. It contains mushrooms and other nutrients to support detoxification of the liver. I took the bottle home that day and started my son on it immediately (in fact, I’m pretty sure I gave him his first dose in the car). I noticed an improvement in his overall demeanor after just one dose. I began giving him the maximum dose twice a day and he became more pleasant and helpful, and all traces of anger vanished. Even in the midst of choosing joy over a strict diet, his symptoms of ODD stayed away. Happy contains a unique blend of liver and immune-system supporting mushrooms, as well as chlorella, which supports detoxification, plus herbs that support the removal of unwanted organisms, like bacteria, viruses, and parasites. Most importantly, it has been clinically proven to reduce angry outbursts. This formula is so powerful for removing infections that a couple of months ago, when several members of our family came down with a stomach bug that lasted for weeks, it was the only thing that finally stopped the symptoms. I had tried everything I knew of to help my family get better, and finally, on a whim, I gave Happy a try, and after one dose the stomach bug was finally abated. Our kids are constantly fighting an uphill battle. Not only do they get bombarded with junk food everywhere they go, but our modern air and water are tainted, and they are frequently given unnecessary pharmaceuticals. Every supplement in the BioRay kids line contains their formula they call “NDF” (natural detox factors), which is comprised of chlorella, an effective and natural ingredient for detoxification. Chlorella is a tiny, single-celled algae. It bonds to heavy metals, chemicals, pesticides, dioxins, chlorine, and BPA. 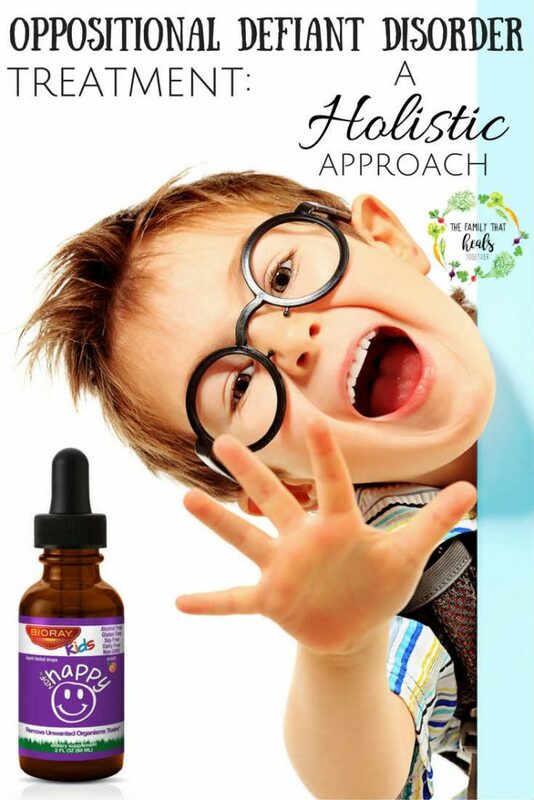 Each BioRay Kids formula combines chlorella with a blend of mushrooms, as well has herbs that are targeted to relieve a variety of symptoms. So far, our family has used Happy, designed to alleviate unreasonable anger, Calm, designed to ease anxiety and nervous energy, and Focus, created to boost attention and improve clarity and cognitive function. Each of these formulas do what they say they do! Please note: BioRay is not paying me to say any of this. I have just been so incredibly blown away by their unique formulas that I want every family to learn about and benefit from them. Their formulas address just about any symptom a child may be dealing with. These formulas have done things for my son’s health that no other supplements have been able to: they provide effective, broad-spectrum,yet targeted results. I’m finding it necessary to keep my son on these supplements, particularly as we’ve enjoyed a summer of fun foods (though fall will be bringing balance back to our diet). Because our kids are constantly exposed to toxins, keeping my son’s body healthy is not a “once and done” situation. If we go long between bottles of Happy, his symptoms start creeping back, particularly if we’ve indulged too much in birthday party food, or he spends lots of time in a new environment, which tends to stress him out and spur on symptoms. I plan to continue his oppositional defiant disorder treatment indefinitely. Have you discovered an effective oppositional defiant disorder treatment? Share in the comments, then be sure to share this post for your friends whose children may be struggling with ODD. If it offends you for me to say that I am healing my son and bringing him back from the brink of autism, it shouldn’t. I have posted about children being healed from autism and have some truly wonderful stories here (read Brendan’s Story: Deliverance from Autism and Gordon’s Story of healing from autism). These children HAD autism and NOW they don’t. That’s all fine and well, but clearly those comments come from highly functioning individuals. 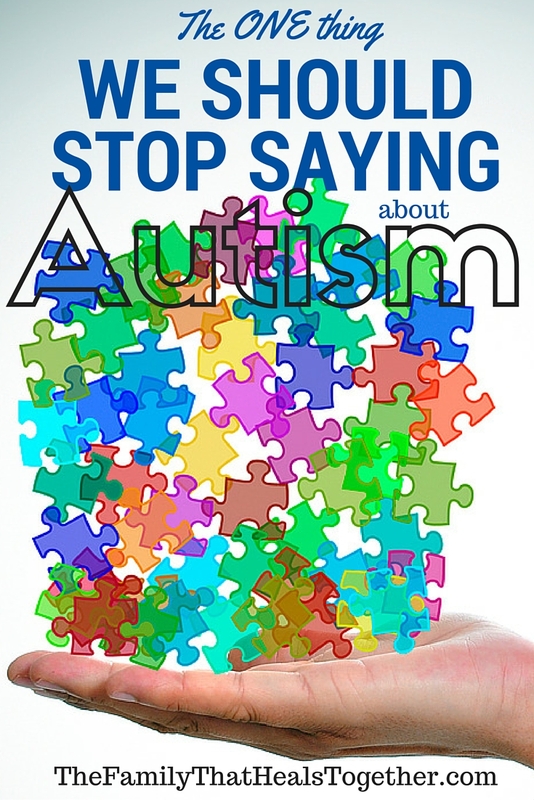 Not all of those with autism are highly functioning. And to say it’s offensive to think autism should be healed is offensive to those working to heal it! What about those parents who are working to potty train a child who is still not using the toilet at the age of 10… 15… 25? What about the mom who spends all day and night attending to her autistic child who cannot be left alone because he will self-injure or injure another child? What about the parents of autistic children who have never slept through the night? Ever? Fine, maybe some of those on the autism spectrum have some unique abilities. There are amazing musicians and artists who see things in ways the rest of us cannot due to autism and the unique functioning of their brains. Those are “neat” stories… but they are the exception, not the rule. Kids with autism are more likely to grow up and have trouble finding and keeping a job. They are more likely to struggle with maintaining friendships, let alone a long-term relationship like marriage. No, autism is not a blessing, it is a disease that steals joy, peace, health, happiness, and years off of individuals’ lives. But it can be healed. 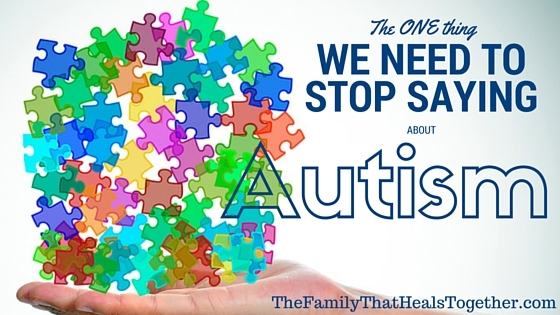 My son was on the brink of autism and had we not completely changed our lifestyle, I’m sure we would have an ASD diagnosis under out belt by now. He had become so difficult in his interactions with other children that we could not spend time with friends. He had no control over his emotions or physical outbursts. He was violent and aggressive. All that changed when we took steps to heal him with food and biomedical interventions. Read about how we healed some of his symptoms in my post PANDAS Syndrome: Camden’s Story of Healing. We have come really far, thanks in big part to the GAPS diet, a temporary, restrictive, healing diet. 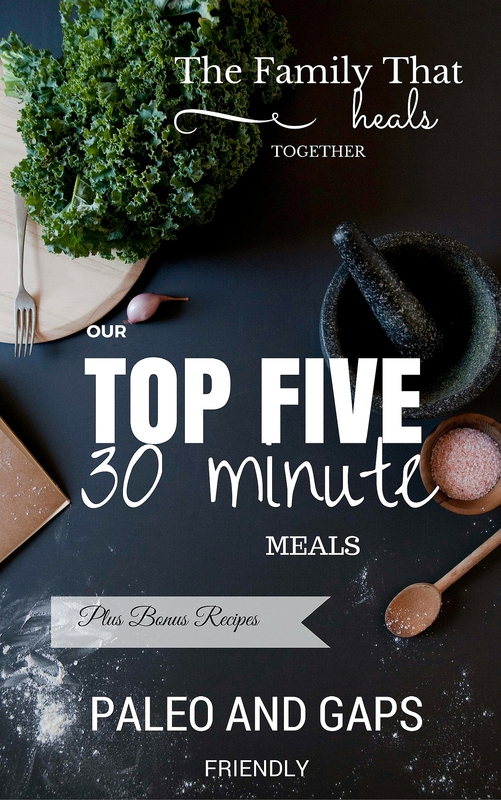 You can read more about our experience with the GAPS diet here. You will never -ever- hear me say that God made my son angry. I will never say God made my son socially awkward. I won’t say autism and related disorders are a blessing. They’re not. The behaviors associated with autism have robbed my family of so much joy and peace and I’m thankful every day we’ve learned how to heal them. If you have a special child with autistic behaviors or full-blown autism, perhaps you can understand where I’m coming from. Perhaps you’ve spent many sleepless nights, up with a child who refuses to sleep, or maybe just worrying about the incessant behaviors that put him or others at risk. And maybe, just maybe, you dream of healing the symptoms known as autism, because deep down, you know that this is not right and this is not who your child was meant to be.